Deputy Prime Minister and Defense Minister Gen Prawit Wongsuwan. 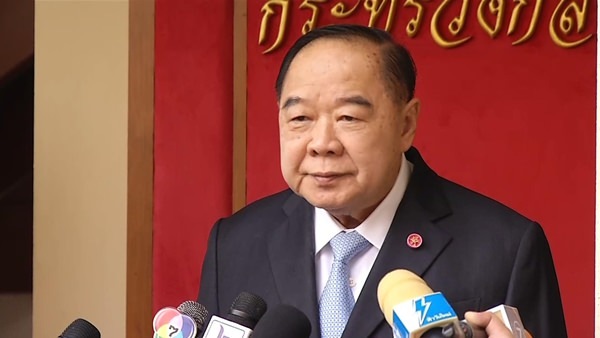 Bangkok – The Deputy Prime Minister for security affairs has confirmed the government’s readiness to maintain peace and order, while elections are organized in accordance with the constitution and as deemed appropriate by the Election Commission (EC). Deputy Prime Minister and Defense Minister Gen Prawit Wongsuwan made the remarks following indications that pro-election activists will organize a major assembly on Saturday, January 19. He noted that any major demonstration or political assembly must be approved beforehand. The deputy premier also said that the general election must be held in accordance with the 2017 charter, but the date must not come into conflict with the coronation of His Majesty King Maha Vajiralongkorn. The date is also subject to change by the EC, as it sees fit. Regarding fugitive ex-premier Thaksin Shinawatra’s new weekly podcast, “Good Monday,” ostensibly instituted to share his views on how to handle changes in the world, Gen Prawit invited the public to decide on the merits of the podcast for themselves and defended his fellow civil servants in the incumbent administration as capable of handling the country’s issues.